This issue’s mascot spotlight is Blaze (Bobby) Blue Devil, a captain on the University of Wisconsin-Stout water aerobics team. Blaze is an early childhood education major and is from the land down under, not Australia though. 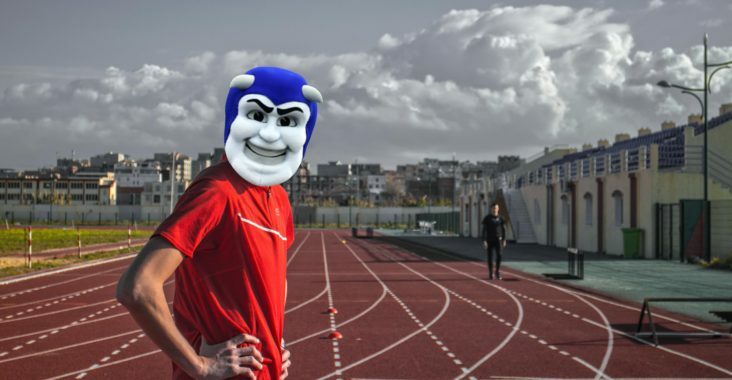 Why did you choose to be a mascot at Stout? Same reasons as most people, free laptops, textbook rental, all the squirrels you can eat, the normal stuff, plus my dad is the Chancellor. Well, when I’m not out chasing people outside or in class, I love reading romantic novels. I love walking my two dogs George Clooney and Buddy and collect soda cans out of the trash ‘cause recycling. I hold the world record for most eggs thrown at Harvey Hall. I’m nationally ranked in Guitar Hero with my beautiful rendition of Sweet Child O’ Mine. I’ve seen the Red Hot Chili Peppers live 14 times and I don’t plan on stopping. I’m thinking about taking over the world, but I’m not sure on that one yet. Hands down it’s Guy Fieri. That dude makes a mean chicken pot pie. I don’t really know yet; maybe I’ll stick around here and hide in the bushes. Maybe I’ll go teach basketball at the YMCA. Maybe I’ll wake up in Europe, forget my whole identity, and realize that I’m an assassin. The possibilities are endless.